Novelists are constantly striving for original takes on old themes and Scot Andrew O’Hagan came up with something markedly different in his latest novel. He even gave up his usual serious style of writing in order to achieve originality through comedy. O’Hagan explained that a decade earlier he was present when six Polaroids of Monroe’s dog Maf sold for a staggering $US220,000 at an auction in New York. He was shocked that such seemingly trivial artefacts would fetch such a high price. Alone in his hotel room afterwards, he poured himself a large whisky and “heard the voice of the dog speaking incredibly sensibly about the 20th century”. Much research later, The Life and Opinions of Maf the Dog and of his friend Marilyn Monroe was the result. Frank Sinatra gave Maf, a Scottish Maltese poodle, to Monroe in 1960 and the actress died in 1962. All of which begs the obvious question, why choose to observe Monroe’s final years through the eyes of a dog? Why not a human? O’Hagan said that Monroe was the most written-about woman in history with almost 800 books about her. But she had been oversexualised. “The complication of sexual need wouldn’t be involved with a dog,” he explained. Learning to see the world from a dog’s perspective, however, did present challenges for O’Hagan who said that he adopted a “Method” approach to the writing and became doglike. One time he visited Monroe’s old stamping ground of Bel Air, Los Angeles and he recalled getting out of his car, not realising that people generally didn’t walk in such affluent neighbourhoods unless they were up to no good. Clearly, judging by the many laughs O’Hagan generated in his hour-long session, he has a strong sense of humour even though there hasn’t been much evidence of it in previous books. Explaining why he chose this time to opt for humour, he said that writing the same book in the same style 20 times for 60 years was a depressing thought. “Writers worth their salt have the potential of variety in them,” he said. Despite it being a very funny book, however, he reminded the audience that it was still about a young woman who was dying. “Sadness and happiness happen together, sometimes on the same day,” he said. He nominated Shakespeare as an example of a great writer who was capable of both comedy and tragedy and Oscar Wilde was “a man who could see the tragedy of life and laugh at it”. Perhaps drawing on Wilde’s example, when asked who Maf would be if he were a human, O’Hagan replied: “A cross between Billy Connolly and Noel Coward”. Not only was Maf an inspired choice of central character for the book but so too was the focus on Monroe. As the number of books about her attests, she resonates strongly with the modern world’s obsessive celebrity culture. Such obsession worries O’Hagan, who recounted once asking a class of school students what they wanted to be when they grew up. Sixty-five per cent of the girls in the class wrote that they wanted “to be famous”. “They couldn’t imagine being real without being famous,” he said. “You used to be famous for something but the condition of just being famous is much newer. 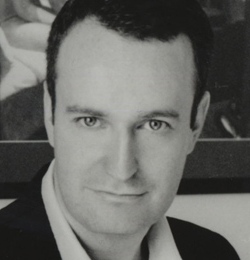 London-based author Andrew O’Hagan was born in Glasgow. His first novel, ‘Our Fathers’, was shortlisted for the 1999 Man Booker Prize, and his second, ‘Personality’, won the 2003 James Tait Black Memorial Prize. That year Granta named him one of the Best Young British Novelists. Andrew was a keynote speaker at the Perth Writers Festival. This entry was posted in 2011 Perth Writers Festival, Blogwax, The Buzz and tagged andrew o'hagan, author, book, dog, marilyn monroe, novel, perth writers festival, write, writer. Bookmark the permalink.